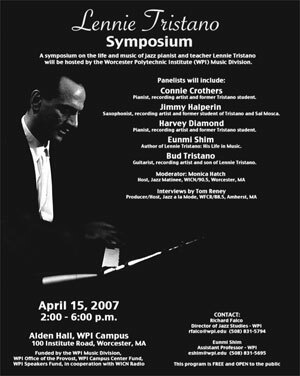 The first symposium ever held on the life and impact of Lennie Tristano was hosted at Worcester Polytechinic Institute on April 15th, 2007. In this collection, we present the complete video of symposium panelists, radio interviews discussing the event, as well as information on the symposium. All materials are presented here with the express permission of their respective copyright owners and WCCA TV (Worcester, MA). Materials may have been edited to remove content for which explicit permission has not been granted. "Lennie Tristano (1919-1978) was a jazz pianist and teacher of jazz improvisation, who emerged as an original voice in the New York jazz scene in the 1940s. An uncompromising individualist, he transgressed the boundaries of jazz as well as conventional style categories of jazz history through a succession of innovations, exploring musical means that were considered avant-garde, evidenced by the 1949 recordings of free group improvisations, which predate the free jazz movement by a decade, his ground-breaking use of multi-tracking in the 1950s, and the intensified use of polyrhythm and chromaticism in the 1960s. Eunmi Shim, Assistant Professor of Music at Worcester Polytechnic Institute (WPI), has written a book, Lennie Tristano: His Life in Music, which is the first in-depth treatment of Lennie Tristano's life, music, and teaching. This book discusses Tristano's pioneering role in extending the concepts and practices of jazz, and re-evaluates Tristano's position in jazz history. This was the first symposium on Tristano, hosted by the Music Division of the Department of Humanities and Arts at WPI on April 15, 2007. Five panelists, including Connie Crothers, Harvey Diamond, Jimmy Halperin, Eunmi Shim, and Bud Tristano, gave presentations and participated in panel discussions and individual interviews, addressing issues concerning the innovations in Tristano's music, his teaching methods, and his contribution to jazz history, among other topics." "How Can You Research Jazz and Its History?" The Jazz History Database is an active and growing library of materials focused on the preservation and education of the History of Jazz in New England. We invite jazz historians, musicians, family members, educators and students to contribute materials! The Jazz History Database is a service of the Massachusetts Association for Jazz Education. All materials have been processed and edited by faculty and students of Worcester Polytechnic Institute in Worcester, MA. All items are used with the permission of contributors and are edited to remove copyrighted content for which permission is not explicitly provided. The content in this site is provided for non-profit personal or scholarly use. No content may be resold, republished, or otherwise used for profit without the express permission of its respective copyright owner.